Welcome to Polypterus.info, a hobbyist website devoted to the Polypterid fishes (bichirs and ropefish)! This site is dedicated both to the enjoyment of Polypterids in the aquarium, and to providing an information resource about these fishes in general. The Polypteridae are ancient, snake-like fish whose origins date back to the time of the dinosaurs! All of the present-day Polypterids come from the freshwater rivers and lakes of Africa. They are able to breathe air via a lung-like modification to their swim bladder, and can travel over land using their strong pectoral fins. There are two genera: the genus Erpetoichthys contains only one species - E. calabaricus, known as the Rope or Reed Fish. 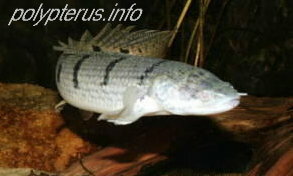 The other genus contains the Polypterus species (bichirs). This site is still very much "under construction" at the moment. All the links work, but there is a lot of material still to be added! "If I had discovered only this species in Egypt, it would compensate me for the pains usually involved in a long journey"
* Geoffroy Saint-Hilaire, E. (1809) Poissons du Nil, de la Mer Rouge et de la Méditerranée. In: Description de l’Egypte, Vol. 1. (ed. Imprimerie impériale). Paris, pp. 1-52.